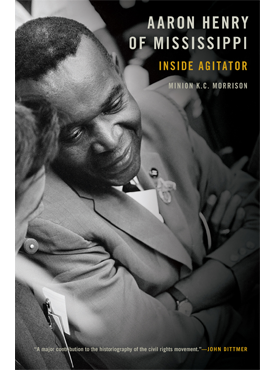 ATHENS, Ga -- A look at segregated public libraries in the Jim Crow South and a biography of a civil rights activist turned elected official are the winners of the 2016 Lillian Smith Books Awards. 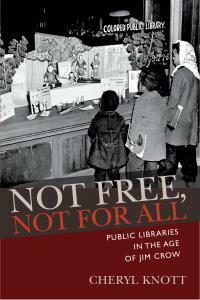 Cheryl Knott, a professor in the School of Information, University of Arizona, will be recognized for Not Free, Not for All: Public Libraries in the Age of Jim Crow; and Minion KC Morrison, professor in the School of Public Policy and Administration, University of Delaware, for Aaron Henry of Mississippi: Inside Agitator. The award seeks to honor works focused on race, social justice, civil and human rights, issues championed by Smith in her lifetime. The ceremony, part of the Decatur Book Festival, is Sept. 4 at 2:30 p.m. at the Decatur Library. “Every year we have to make tough choices among the 40-plus excellent entries. The two winners this year join the lineup of so many distinguished winners that have been our honor to choose over the years,” said Mary Twining Baird, chair of the board of judges. Knott’s articles have appeared in scholarly journals, including Library Quarterly, Libraries & Culture, and Library Trends, have focused on the history of public libraries and on information access broadly construed. She holds a doctorate in library and information science from the University of Texas at Austin and master’s degrees in history and in library science from the University of Arizona. Morrison is a professor in the School of Public Policy and Administration at the University of Delaware, having served as professor and head of the Department of Political Science and Public Administration at Mississippi State University, where he was also senior Associate in African-American Studies. He has been on the faculty of the University of Missouri-Columbia, Syracuse University, Hobart & William Smith Colleges and Tougaloo College, and has been involved variously in political science, freshman studies, Third World Studies and African and Afro-American Studies. The Southern Regional Council established the Lillian Smith award shortly after Smith's death in 1966. Internationally acclaimed as author of the controversial novel, Strange Fruit (1944), Lillian Smith was the most liberal and outspoken of white, mid-20th century Southern writers on issues of social and racial injustice. Smith’s family donated the collection of her letters and manuscripts to the University of Georgia 's Hargrett Rare Book and Manuscript Library and, in 2004, the UGA Libraries joined the SRC as a partner in administering the awards. The property where she lived and worked in Clayton now serves as an educational center and an artist retreat, the Lillian E. Smith Center of Piedmont College. In 2015, the college joined as a partner in presenting the awards. The Georgia Center for the Book is also an award sponsor, joining in 2007. On July 29, 2016, a federal judge ruled that several provisions of Wisconsin’s voting laws are unconstitutional because they discriminate against African Americans. The circumstances that led to the judge’s decision began when Wisconsin Republicans won legislative majorities in 2011. They immediately enacted several measures that made voting more difficult and manipulated state laws to give themselves a partisan political advantage. This was part and parcel of a massive effort by Republican-dominated state legislatures to suppress the participation of African American, Hispanic, and Asian American voters in the electoral process. Wisconsin’s tactics included implementing one of the harshest voter ID laws in the nation, restricting early voting hours, changing laws regarding absentee ballots and changing regulations in a way that injected partisanship into polling places. Other changes included unprecedented partisan redistricting. The lawmakers reduced the time during which municipalities could offer in-person absentee voting from 30 days to 12 and eliminated “corroboration” as a means of proving residence. The laws required that any “dorm list” that would be used with college IDs had to include a certification that the students were United States citizens. The residency requirement for voting was increased from 10 to 28 days before an election. Another measure eliminated straight ticket voting. Legislators also eliminated the State’s Government Accountability Board authority to appoint special registration deputies who could register voters. Another law prohibited municipal clerks from faxing or emailing absentee ballots to absentee voters other than overseas and military voters. A City of Madison ordinance that required landlords to provide voter registration forms to new tenants was overturned. This was intended to suppress the votes of students who attended the University of Wisconsin and other colleges in Madison. Another law required all voters to provide documentary proof of residence when registering to vote. A lawsuit was filed that challenged the laws under the First, Fourteenth and Fifteenth Amendments of U.S. Constitution and Section 2 of the Voting Rights Act. 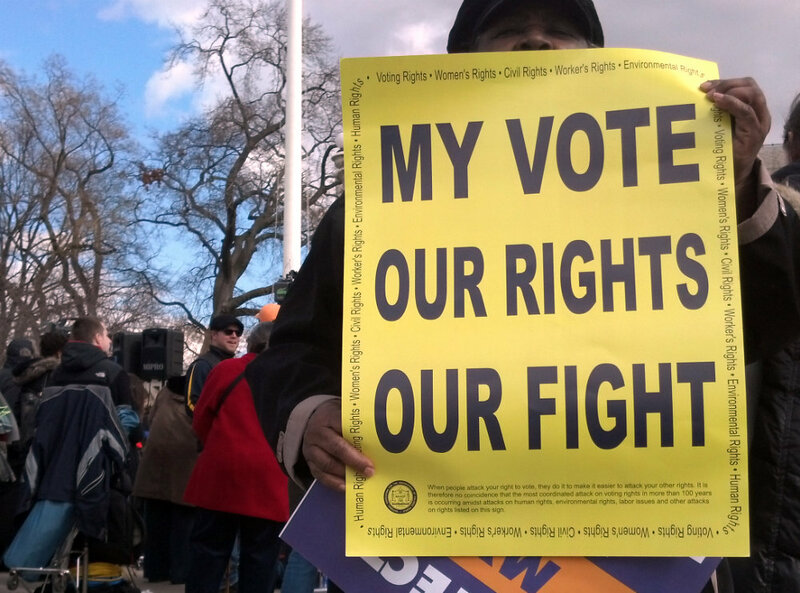 The judge ruled that several provisions of Wisconsin’s voting laws are unconstitutional as they were designed to suppress African American voter turnout. The state was ordered to issue credentials for voting to anyone trying to obtain a free photo ID for voting, but did not possess the underlying documents needed to obtain one. He called the state's current process for getting free IDs "a wretched failure" because it has left a disproportionate number of black and Hispanic citizens unable to obtain IDs. The judge also struck down restrictions limiting municipalities to one location for in-person absentee voting and limiting in-person early voting to weekdays. The Court found that weekday limitations intentionally discriminated against Democratic-leaning African Americans in Milwaukee. The judge invalidated the increase in residency requirements, the prohibition on using expired student IDs to vote and a prohibition on distributing absentee ballots by fax or email. The Court recognized that laws were designed achieve a partisan objective, “but the means of achieving that objective was to suppress the reliably Democratic vote of Milwaukee’s African Americans.” This was deliberate, unconstitutional racial discrimination. The Republican Party has gone to extreme lengths to suppress turnout of traditional Democratic constituencies. Their tactics are a throwback to an earlier and uglier era. Disenfranchisement during Reconstruction was based on laws, new constitutions, and practices that were used to prevent African American from voting. Those measures were enacted by the former Confederates who gained control of state legislatures after federal troops were withdrawn from the South. Their sordid tactics were used to return political control to White Democrats and to impose a regime of racial segregation and White supremacy. The difference this time involves Republican-dominated legislatures that are engaging in massive voter suppression. A different political party is leading the current effort but the racist objectives are the same.